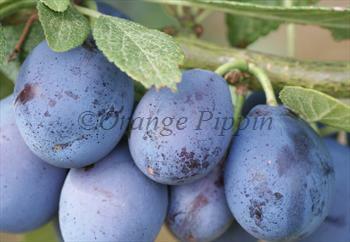 Blue Violet is a traditional English damson from Cumbria. It ripens a earlier than other damsons, and also has a sweeter flavour - unusually for a damson it can be eaten fresh as well as being versatile in the kitchen. The fruit size is also a bit larger than normal for damsons. Blue Violet is also easy to pick, as the fruits fall from the tree in the wind or when shaken. Please fill in the details below and we will let you know when Blue Violet damson trees are back in stock. Blue Violet is in flowering group 3. Blue Violet is self-fertile and does not need a pollination partner, although fruiting may be improved if there is a compatible tree of a different variety nearby. Since it flowers in the middle of the blossom season it can be pollinated by most other damson trees. For best fruit size and flavour you can thin the fruitlets after the blossom has finished. Blue Violet was found in the 1930s in the Lyth Valley, in the old county of Westmorland - the heart of English damson cultivation.